Dinosaur activities for preschoolers are engaging, playful, and tons of fun. Every learning station in a classroom or home environment can involve DINOSAURS!!!! 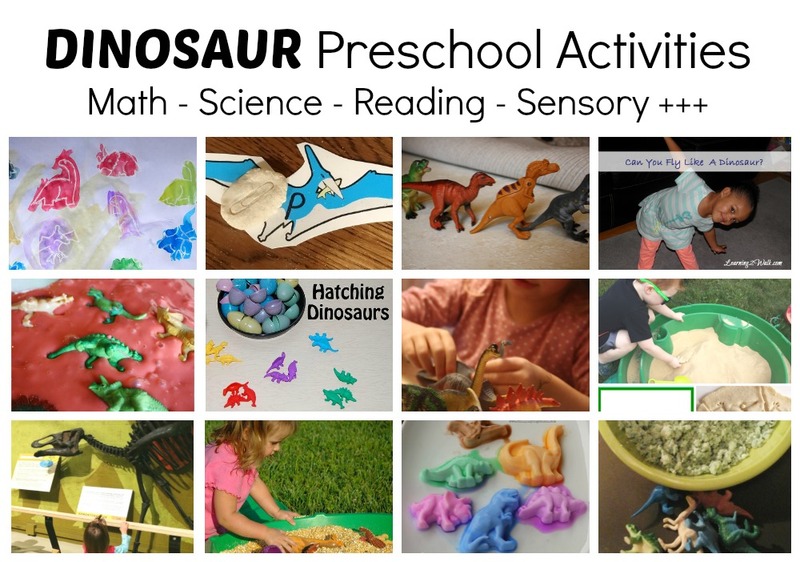 Reading, math, science, sensory, art, movement and outdoor play can all center around the dinosaur theme. 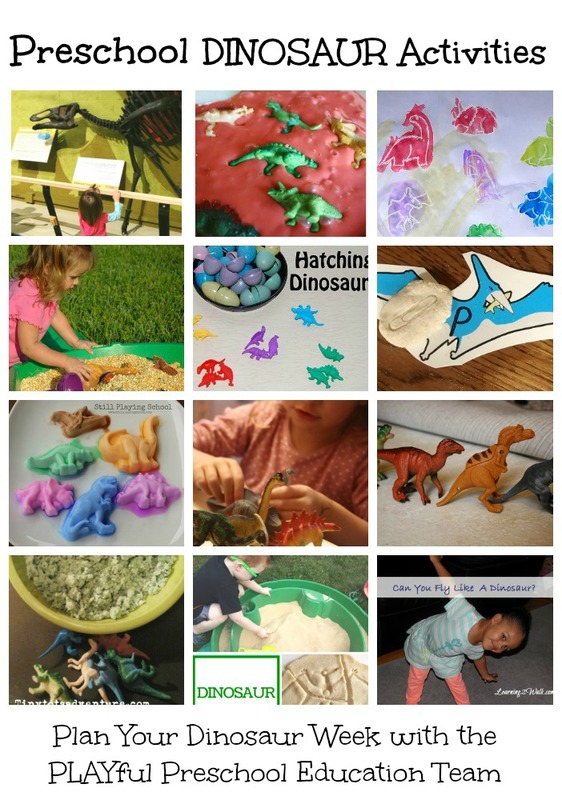 Here are a few quick and easy learning stations that you can set up for a preschool dinosaur theme. This station is for children to read and count the dinosaurs and the books. 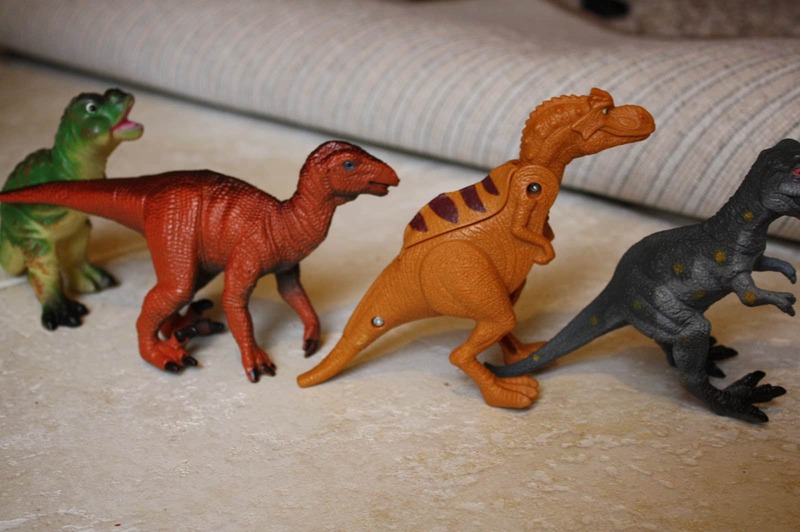 Encourage the children to line the dinosaurs up in a single file before counting. Added math challenge: See if they can make groups of 2 dinosaurs. Discuss even and odd numbers. Preschool mathematics encourages measurement with non-standard units of measurement. I like to use a mixture of standard and non-standard measurement activities so that they get used to using the tools for a variety of purposes. 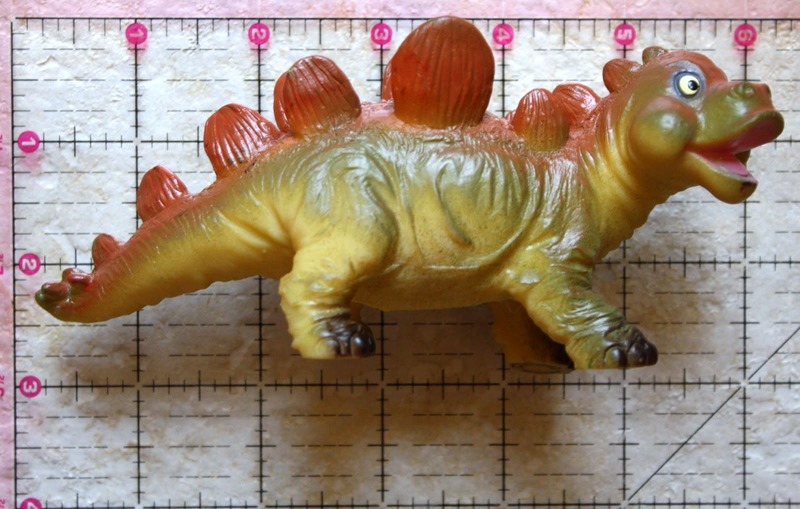 In this station, preschoolers are encouraged to measure the lengths of the toy dinosaurs using a ruler. They can measure from top to bottom or from snout to tail. Remind them to line the end of the dinosaur up at the edge of the ruler (or 0 if it was printed). This dinosaur is 6 inches long. If you are in a classroom – this station would be great to have a volunteer or intern helping out at, asking the children open ended measurement questions and helping them use the ruler for measuring. I love math stations that are connected with a story. 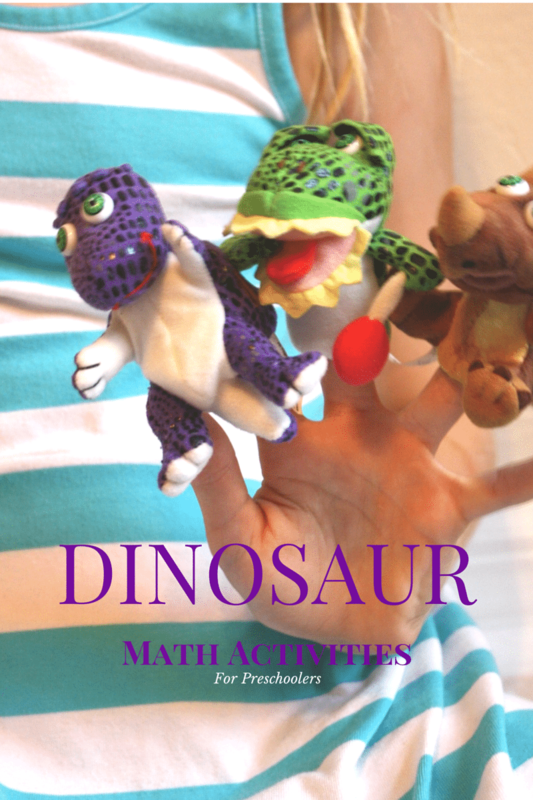 This packet comes WITH the puppet, making it an easy to prepare dinosaur math activity as well. Each puppet has a number sewn onto it. 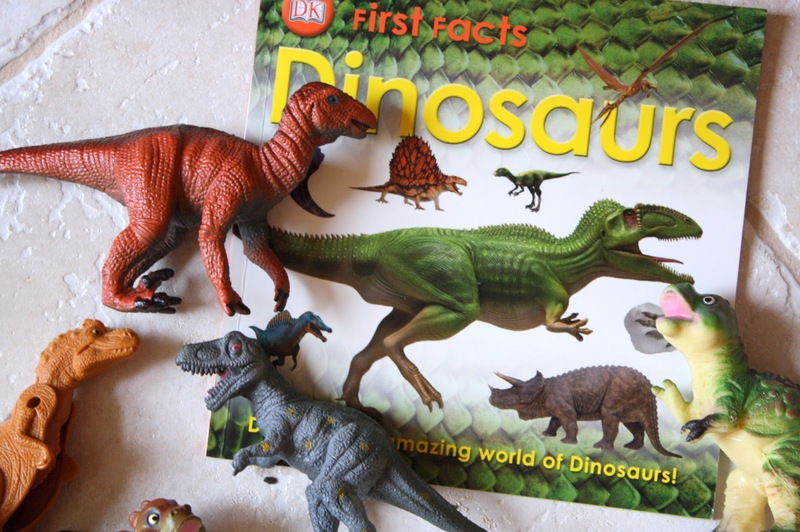 Children read and count by putting numbered dinosaur puppets in order on their fingertips. They can pretend and create number stories too. 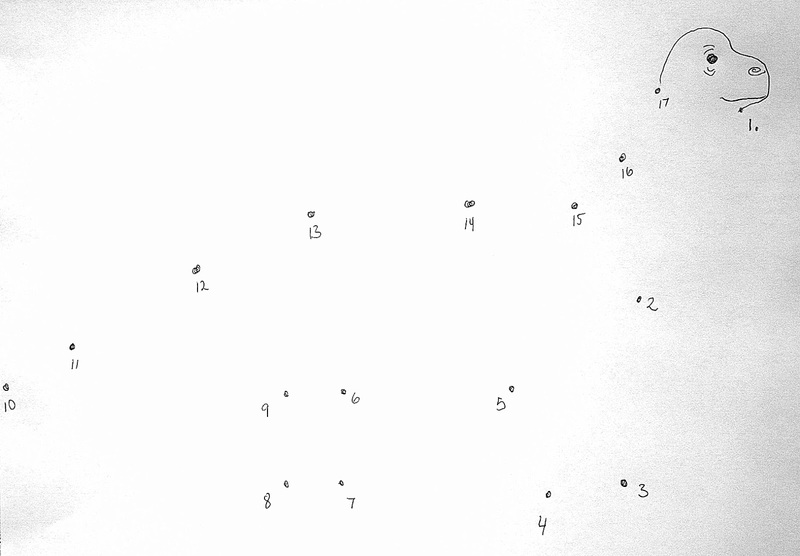 Parents and Teachers: Ahead of time make a dinosaur dot-to-dot by placing dots in the shape of a dinosaur. I sketch the head. Then put the numbers in order starting at the head. Have your child connect the dots and say the numbers outloud as they write. Color the dinosaur in when completed. Parent Note: This is great for hand-eye coordination and developing pencil control as well as math. I say DRAW and make your own, because it is important to show your preschooler that everything doesn’t have to be perfect. Sketching is OK. Making your own is OK! So go ahead and be adventurous. What dinosaur will you try? And just for you Natasha…. My kids LOVE, LOVE, LOVE Koo Koo Kanga Roo. Watching and doing this video is a great way to have preschoolers doing some math patterning through dance and movement, while connecting it to the dinosaur preschool theme! A fabulous collection of ideas! Thanks Devany. My kids are already at the table making all the other ideas right now too. Our kids would love your dinosaur math stations! I like the wide variety of ideas you shared. It would be fun to set up a different dinosaur math station each day for a week. It would give them something fun to anticipate. Which dinosaur math activity will we get to try today? Great ideas for connecting dinosaurs and math! A wonderful collection of dinosaur math ideas. I want to try the connect the dots, seeing how we have been playing around with that idea. Great math suggestions for the Dinosaur Theme! I absolutely LOVE your dino dot-to-dot – so important to know that trying and creating does not have to be perfect for kids to learn and play! Great post! My son will love these especially the measuring dinosaurs. We may modify the math to be a little more advanced but super cute ideas. Thank you.